I love Bangkok, Thailand. My inspiration to live in this country sparked from an initial desire to pursue meditation, but slowly evolved into a place I could experience my daily life in. 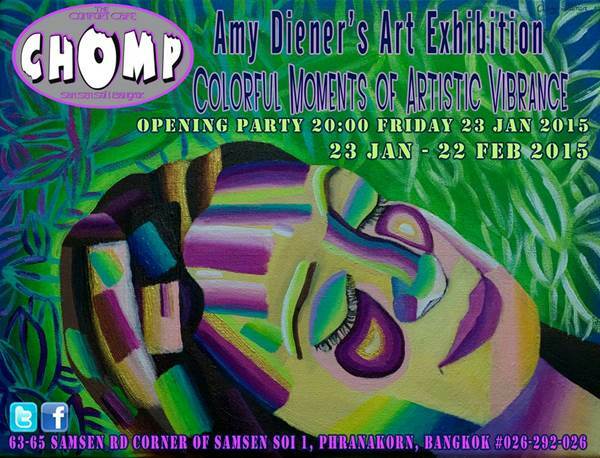 As an artist, the first thing I noticed was all the beautiful, bright colors of Bangkok: the golden temples, hot pink taxis, lime green motorcycles, turquoise blue oceans, light tan sands, and purple flowers. All these colors provoked emotions of excitement and happiness; they were colors I was inspired to use in my paintings. I specialize in commissioned portrait paintings; however, I also paint subjects such as animals, flowers, landscapes, fantastical architecture, and pure abstraction using these vivid colors and large bold brushstrokes. I hope to bring you to a world of love and joy through my artwork. Opening reception - 8pm on 23 January.